Yes, Bussolati designs magazines. We decided to let the world know and what happened next? We won a prestigious Gold Award from Graphis. The short list of Gold winners reads like a Who’s Who of advertising around the world. And we were included! Man it felt good. Can you imagine, though, how good it felt the next year when we got a Gold again? The hoots are still reverberating around the universe. And if that wasn’t exciting enough, when the Graphis Advertising Annual arrived, we saw that they gave us a two-page spread. Yaaasss. While we think that unpaid opportunities to engage with your audience should be fully leveraged, we still believe there is a place for advertising. But isn’t the challenge always what message will work? Let us share the story behind the messaging of our two Gold wins. 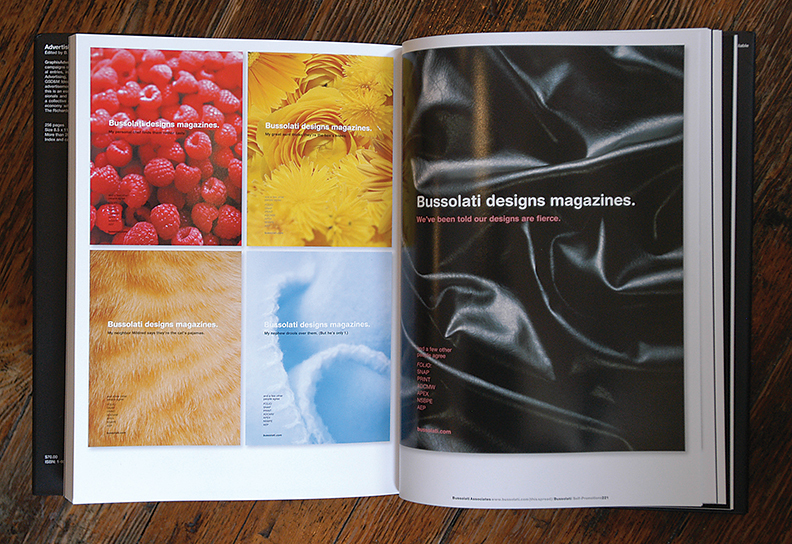 Bussolati defined a niche audience for our magazine design/redesign services. Our audience reads AM&P’s Signature magazine, which is populated with ads from firms that provide same or related services – some are designers, some are in ad sales, others are printers. We took note that great design alone was not going to help us stand out in that crowd. Showing magazine cover samples in the ad was an often used design solution for designers, printers and ad buyers; we knew we would not take that approach too. Then, our creative brief just about designed the ad for us, it said: We want an ad that says, “Bussolati designs magazines.” Funny that it took us reading our own words to see it. That’s where our concept started. After the first release of the ad, we received emails from readers commenting that our ad was funny or clever. It was noticed! The ads brought us new business opportunities and the silly messaging gives people something to talk about with us when we meet at conferences, like a social lubrication. A nice side benefit.